Oh man, it’s so hot outside! When the summer heat is at its worst, car door handles become like glowing irons removed from the fire and it feels like nature is one big oven. Summer heat is especially hard on your office building’s air conditioning unit. Consequently, the heat can put your computer equipment in danger. Portable cooling to the rescue! Like a refreshing dip in the swimming pool, a portable cooling unit brings sweet relief to everything in your office building, computers and personnel alike. However, you want to first point the portable cooling unit toward your server closet. A server unit is essentially a heater, which means that summer makes cooling the space twice as difficult. Hot summer days put a lot of stress on your building’s air conditioning unit, causing your electricity bill to skyrocket. One advantage to a portable cooling system is when it comes to cooling your server room during off-hours, like nights and weekends. For example, during office hours, you have to keep the rooms where people work reasonably cool, but you have to keep the server room cool at all times because your server units are always running. Having to run the building’s air conditioning to cool off the entire office just to keep one room cool is a huge waste of money. 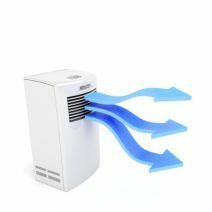 In fact, in an interview with Processor magazine, vice president of Atlas Sales & Rentals makes the claim that, “a portable air conditioner installed for this purpose will pay for itself in heating, ventilation, and air conditioning (HVAC) energy saving in no time vs. running the entire building central system.” Any technology that pays for itself is worth taking advantage of. On hot summer days, you will want to give priority to your server room. Higher temperatures mean that computers have to work harder to do their job. The inside of a server unit is always warmer than the temperature of the room. Just because you’re able to tolerate a hotter-than-normal room, doesn’t mean your computers can. A server unit running hot is in danger of overheating and crashing, which would cost your business dearly in downtime and data loss. Don’t let the summer heat melt your data and your dreams; break out some cold popsicles and portable cooling units, and put downtime on ice! For more tips on how to keep your technology cool, call Tektonic at (416) 256-9928.